Fun and easy to make, this delightful cone is perfect to use a favor or Christmas ornament. 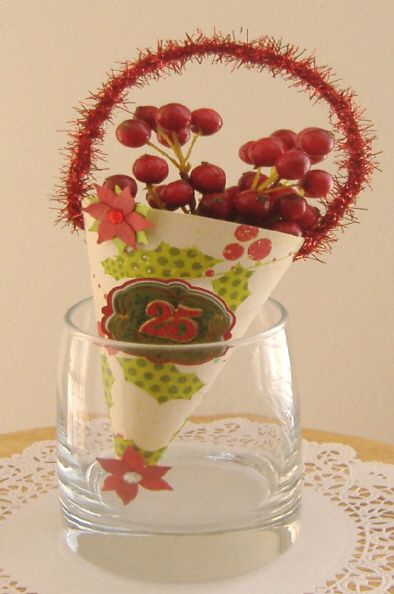 Holly berries patterned cardstock is used for the cone, decorated with paper poinsettias and dimensional stickers. Plastic berries complete the ornament. 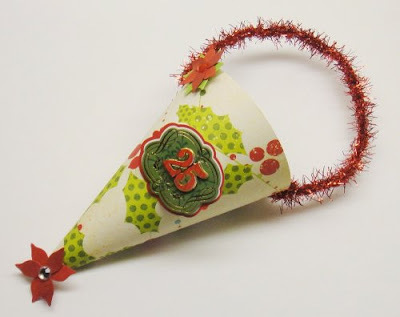 Use a pencil to trace the cone template onto patterned paper of choice. Cut around the shape with scissors. Attach double-sided tape to one side of the 'inside' of the patterned paper. Roll it up and form a cone shape. Press the tape to the outside of the cone to secure it in place. Punch two holes on the outside of cone. Cut a length of wired edge ribbon. Decorate cone with paper poinsettias and dimensional stickers or other embellishments of choice. Copyright © 2010 by Maricel of Fairfax. All rights reserved.